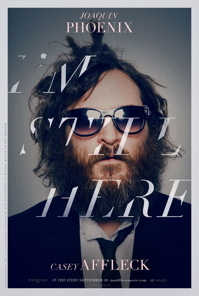 Full disclosure: I went into I’m Still Here not aware, until the credits, that it was not actually a documentary. The movie follows Joaquin Phoenix as he retires from acting to start his rap career, already a suspected hoax, and the film itself is a mockumentary. However, believing that it was real made it more enjoyable somehow. Phoenix portrays himself as a simultaneously abrasive and pathetic character, one that you like even as the film laughs at him. In his raw messiness (I frequently got distracted from the movie while staring at the dirty beard apparently eating his face) I marveled both at his narcissism and willingness to let a camera invade his egotism and vulnerability. All this led to priceless moments: Phoenix looking for hookers online, Phoenix being high (90 percent of the movie) and saying to Casey Affleck, his brother-in-law and the film’s director, that “if you speak metaphorically, you have to let me know. Say, ‘Speaking metaphorically,’ or something.” At one point the actor Edward James Olmos tells Phoenix that he is a drop of water on top of a mountain that will fall into a valley and evaporate. Phoenix spends the rest of the film misinterpreting the comment. Another scene from I’m Still Here shows Phoenix on the David Letterman Show in 2009, an interview so awkward and uncomfortable it reminded me of watching Borat with my parents. (No lie.) After a minute or two of Letterman trying to elicit some reaction out of Phoenix by joking about his beard, while Phoenix appears to be nervous and resentful, Letterman says, “Well I’m sorry you couldn’t be here tonight, Joaquin.” With the first half of the movie spent developing Phoenix as a character, Letterman comes off nosy, elitist and rude (even though Phoenix is the one taking his gum out and sticking it under the table on camera). It makes polite seem fake, and crass seem real. Aside from questions of real or fake, here or not here, I’m Still Here has terrible sound quality (an attempt to convince the audience that it’s a legit documentary? ), but a large part of the sound problems come from Phoenix’s voice. When he talks, it all runs together, and when he raps it’s unintelligible, which might have been a good thing considering the lyrics I could make out (“Compli … cations, compli … f***ing … cations” and a frequent “I’m still here … b****”). The ending, which hits a strangely sincere note after two hours of mockumentary, stopped me from feeling misled when the credits rolled. And I left the theater feeling like I had been subjected to either an experiment or performance art. Despite the publicity stunt, the movie is interesting enough to stand on its own.